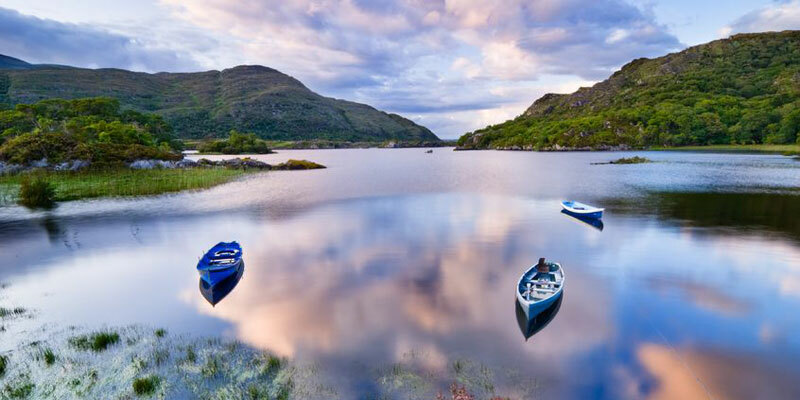 Killarney National Park is a the perfect holiday destination for for all ages, offering a range of outdoor activities and holiday accommodation. Wildlife enthusiasts can enjoy the varity of widlife. Our website is optimised for all Smart Phones and Mobile Devices. You can find and book your ideal holiday cottage/homs/villa, B&B, guesthouse, hotel or campsite even when you're on the move! Thousands of owners trust us to promote their Business. Advertise your Holiday accommodation or Business to the millions of visitors to LovetoEscape.com today! Killarney National Park is located beside the town of Killarney, County Kerry, Ireland. It was the first National Park established in Ireland, dedicated in 1932, and encompasses 25,425 acres of diverse landscapes and ecosystems. Composed of the Lakes of Killarney, Oak and Yew woodlands of international importance, and mountain peaks, this varied region has some of the best scenery in Ireland and is a popular tourist destination. The Lakes of Killarney National Park are Lough Leane (the lower lake), Muckross Lake (the middle lake), and the Upper Lake. There are boat trips to Innisfallen Island on the Lower Lake and to Dinis Cottage on the Middle Lake. For superb views of the lakes and Killarney Valley, take a drive from Killarney Town along the Kenmare Road. There are many historic sites in the area as well, one of which is Ross Castle. A great place to start exploring National park is the Muckross Estate and Gardens, 5km south of Killarney Town on the Ring of Kerry. Walking and cycling are a great way to see the National Park. There is plenty of surfaced tracks in the Muckross, Knockreer and Ross Island areas of the park. Bicycles can be rented in and around Killarney Town. There are several rare species of animals and plants, including Ireland's only remaining native herd of Red Deer and the Killarney Fern, which grows in the splashzone of waterfalls and other damp places. The flora and fauna here are incredibly diverse and many of the rare species are actively conserved by the National Park status of the region. This makes it an excellent holiday destination for wildlife lovers, bird watchers and botanists, and also anyone interested in nature. Abbey Lodge is a family run Guest house offering B&B accommodation in large rooms. Situated next to Killegy Church and is less than a 5-minute walk from Killarney town centre. Killarney Plaza Hotel & Spa Kerry. Hotel and Spa in Killarney, County Kerry. Hotel and Spa with a swimming pool. 4 star Hotel and Spa in Kerry, Ireland.